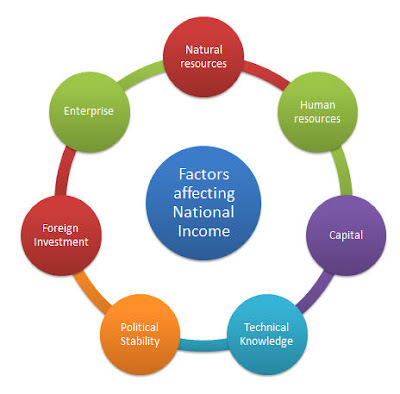 Question: List the factors that affect the national income. National income refers to the summation of all incomes accrued over a specified period by the residents of a country. ① Natural Resources: It includes land, rivers, mountains, forests, minerals and climate. Richer in natural resources, greater the national income will be. e.g. a good monsoon news lifts the sentiments of equity market. ② Human Resources: Skilled workers, quality of labour force, working population are considered assets to nation and contribute to the national income. If the labour is skilled, efficient and available in good size, size of the income would reap. In last two decades, the availability of skilled IT workforce boosted our national income. On the other hand unskilled and underfed labour could have negative impact on national income. ③ Capital: It is considered to be the sustenance of modern industry. Poor implements, primitive tools and machines hardly make any growth in the national income. While the modern type of plants enhances production and have significant positive impact on national income. ④ Technical Knowledge: New technology, innovative methods of production increase the output of good and services and contribute to nation's growth. ⑤ Political Stability: It is an essential aspect for the growth of economic and business activities. Civil unrest, war, frequent strikes or blockades constantly intefere with prductivity and aggravate commercial risks. A peaceful and stable governance encourages production. ⑥ Foreign Investment: Foreign investment flows bring new oppotunities in terms of jobs and business. Investment specially in infrastructure projects (like power, transport, highways etc.) have multiplier effect on national income. ⑦ Enterprise: The availability of management and enterprising skills affect the use of resources and, the size of the national income.